Flor Santos* is a regular at the monthly Parent-Principal Chit Chat at her son’s school, Thomson Elementary (DCPS), but this time was especially important. 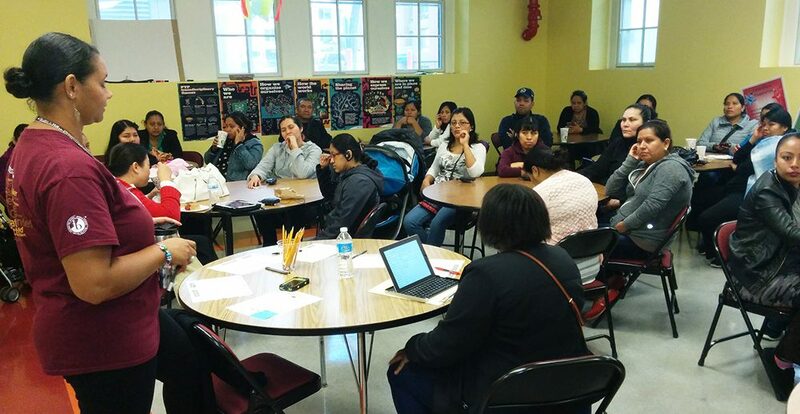 When she stopped by the parent center the previous week, she heard that Principal Carmen Shepherd was going to address parent concerns related to rising anti-immigrant sentiments, ICE raids, and what families should expect from the school (especially during school hours). The Chit Chat, a Tellin’ Stories signature activity, was held on a blustery, sleet-filled morning in March. Ms. Santos followed the discussion via simultaneous Spanish interpretation over a headset. (Teaching for Change provides an interpreter and equipment during the monthly chit chats.) When Principal Shepherd introduced the topic, a hush spread over the room. Through a partnership with the school, Teaching for Change helped coordinate immigration and know-your-rights workshops in the Thomson parent center. Read more about the call for sanctuary schools and how D.C. schools are stepping up for immigrant families.